I am occasionally asked, when people find out I write about history, why historians spend so much time talking about war. Well, with apologies to Mike Love, the history of war is the history of mankind. By and large human history rotates around moments of great change, and change rarely happens without conflict. The history of the church, having also been made by humans, is no different. If it hasn't been a case of Christians warring with non-Christians, it's been Christians warring with Christians. And, as in the case of secular conflicts, war tends to bring out the worst in the children of God as well. There are many events for which the church and individuals will have to answer. One of those events centers around an Irishman named Oliver Plunkett. Plunkett was born in 1625 near Oldcastle, Ireland. He studied for the priesthood at the Irish College in Rome where his record was described as "particularly brilliant." Ordained a priest in 1654, Plunkett was selected by the Irish bishops to be their representative in Rome. On July 9th, 1669, he was appointed to the Archbishop of Armagh, he received the pallium on his arrival in England July 28th, 1670. While Plunkett was in Rome, the other great Oliver of the day, Oliver Cromwell, invaded Ireland. Cromwell, as Lord protector of England, had enacted anti-Catholic legislation. Catholic priests were outlawed. Those who dared to administer the sacraments were hanged or transported to the West Indies. In Ireland, his usually well-controlled Protestant troops were permitted to inflict terrible atrocities upon Irish Catholics. During his tenure Plunkett sought to improve the lot of his people. Taking advantage of a brief period in which the Penal Laws were slightly relaxed, he built schools for both the young and clergy and set about reorganizing the ravaged Church. He also tackled drunkenness among the clergy; true Christianity, Plunkett believed, sobers people and makes them more orderly. As an agent of Christ, Plunkett worked toward those ends. Records indicate he confirmed 48,655 people into the faith, and persuaded hundreds of couples who lived together without marriage to marry. One incident merits special mention. There was a considerable number of displaced Catholics in the province of Ulster, most of whom had their property confiscated, who banded together and, as outlaws, lived by plundering those who lived around them. Anyone who sheltered them faced the death penalty by British law, anyone who refused them such shelter met with death at their hands. Plunkett went in search of them, facing great personal risk, and convinced them to renounce their career of plundering. He also managed to negotiate pardons for them so they could exile themselves to other countries rather than face the death penalty, and thus peace was restored throughout the whole province. Nearly twenty years after the death of Cromwell, new outbreaks of anti-Catholicism forced Plunkett into hiding in 1673. Catholics were required to register for deportation at any seaport - failure to do so would have grave consequences. Plunkett refused. He continued however, to shepherd his flock. Many followed the example of their Archbishop and the underground Catholic church thrived despite the efforts of one Lord Shaftesbury. Plunkett was finally arrested in Dublin in 1679. Shaftesbury, falsely accused Plunkett of plotting a French invasion of Ireland. He was tried at Dundalk for conspiring against the state by plotting to bring 20,000 French soldiers into the country, and for levying a tax on his clergy to support 70,000 men for rebellion. While awaiting trial in Dublin Castle, Plunkett showed his Christ-like character when, despite years of rivalry with Peter Talbot, archbishop of Dublin, over the question of who should be primate of Ireland, he forgave his fellow captive and administered to him the Catholic rite of absolution. When a jury refused to convict Plunkett in Ireland, Shaftesbury, realizing the archbishop would never be convicted in Ireland had him moved to Newgate Prison, London. The first grand jury found no validity to the charges, but he was not released. The second trial was a kangaroo court; with two Franciscans bringing false testimony against him. Plunkett was found guilty of high treason on June, 1681 "for promoting the Catholic faith," and on July 1, 1681 was executed by being hanged, disemboweled, beheaded and quartered. He was the last Catholic executed for his faith in England. Even at the time many people were appalled at the manner in which Oliver Plunkett had been tried, convicted, and sentenced. Lord Campbell, writing of the judge, Sir Francis Pemberton, called it a disgrace to himself and his country. The bitterness of those days lives on in divided Ireland even today. 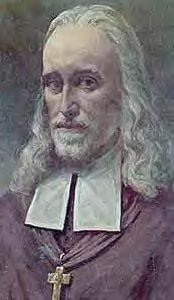 Oliver Plunkett was canonized and became Saint Oliver on October 12, 1975, only 32 years ago this week. But it should be noted that when Pope Paul VI canonized him he was the first Irishman in almost 700 years to receive the honor. 2. Various other Internet articles. October 8, 451: The Council of Chalcedon opens to deal with the questions of Christ's nature. Two groups, the Eutychians and the Apollinarians, believed Jesus could not have two natures. His divinity, they believed, swallowed up his humanity "like a drop of wine in the sea." The council condemned the teaching as heresy and created a confession of faith which affirmed the Nicene Creed. October 9, 1000: Leif "the Lucky" Eriksson is reported to have been the first European to reach North America on this date. What is not widely reported is that he would later evangelize Greenland also making him the first to bring the gospel to North America. But while he was certainly a member of an early Viking voyage to "Vinland" (probably Nova Scotia), it's doubtful he led the initial expedition. October 10, 1821: Law student Charles Finney goes off for a walk in the woods near his home to settle in his own mind the question of his standing before God. That night, at the age of 29, he experienced what he would later describe as "waves of liquid love throughout his body." He emerged from the woods fully convinced of the reality of the gospel message and before long became American history's greatest revivalist purportedly responsible for the conversion of as 500,000 people. October 11, 1521: In responce to his tract "The Assertion of the Seven Sacraments," written against Martin Luther, Pope Leo X conferred the title "Fidei Defensor" (Defender of the Faith) upon England's Henry VIII. Three popes and 13 years later, when Henry couldn't get the church to grant him a divorce or annulment from his first wife, the infamous British monarch severed all ties with Rome, making the Church of England a separate church body. October 13, 1836: Lutheran pastor Theodor Fliedner opens the first deaconess training centre in Kaiserswerth, Germany. The centre was opened despite the fact he had no curriculum and no teachers. Seven days later Gertrude Reichardt, the 48-year old daughter of a physician, applied for deaconess training. After her interview Theodor saw her as the answer to prayer and put her in charge of the centre. October 14, 1066: William the Conqueror leads the Normans to victory over the English Saxons in the Battle of Hastings. William is also considered one of England's most important religious reformers; he spent his last days in intense Christian devotion.